To start, they know what a vegan is in Columbus and they actually know how to feed and nurture one, which is good thing, because it looks like I am going to staying there for the better part of three months starting sometime in February. I was very impressed with Dr. John Byrd and his team at OSU. Thorough, prepared, caring, smart and humane. I must review pages of notes taken by my daughter, Heather who flew down from Chicago and her studying for the bar in Illinois (she is already licensed to practice law in NY) to be my scribe, second set of ears, and moral support for the whirlwind tour of this cold and windy central Ohio college town. Over the next week, I will share what I learned, my decision process, and the next steps to get things going. Right now I am still recuperating from the sleep deprivation of an alarm ringing before 4AM (1 AM Pacific time) to get to the airport on time for our flight home. But it all going to be OK. They have good vegan food, a new drug that could save my life, and an NHL hockey team. Dr. John Byrd is the lead investigator on the clinical trial NCT01217749 that is the reason I am flying to Columbus hoping to enroll to procure this exciting new therapy. Anticipating the future, Dr. Byrd co-authored an important article (Novel Therapies and Their Integration into Allogeneic Stem Cell Transplant for Chronic Lymphocytic Leukemia Biol Blood Marrow Transplant 18:S132-S13) that articulate how the trial drug- PCI-32765 and other promising novel therapies may effect the time and place of transplants in CLL. It is a clear, thoughtful and accessible discussion that I strongly recommend. Thank you for your thoughtful review of this important topic. Implicit in your review of the evolving therapeutic paradigm for novel therapies and RIC HSCT in CLL is a shift in the calculation that each doctor and each patient must make when dealing with aggressive CLL . Before the bloom of these new treatment options, an informed patient or hematologist could make a good faith calculation on what gives the better chance of PFS in five or ten years. Although it is always dangerous to compare data from one trial to that in another, and even more so to assume that statistics that are applied to a group can predict what happens to an individual, one could still study the Kaplan-Meier curves for a HSCT and any particular therapy and make at least a partially informed choice. Now with the promise of the new treatments, the decision to consider a transplant has become more tricky for some. The K-M curves are known on the transplant side of the equation, but what the novel therapies will yield is based on extrapolation of very thin data. We are comparing a known to an unknown. Ironically, with the survival rates so poor for F refractory or 17p del disease, this "unknownness" is a source of hope for some patients and another reason for others with the aggressive or refractory CLL to consider a clinical trial over a more conventional route starting with chemotherapy and moving to transplant. What is implicit but not explicit in my letter to Dr. Byrd is how I myself employed precisely this hopeful calculus in my decision of the known versus the unknown. As I leave tomorrow, I will keep you informed every step on the way. It calls for snow in Columbus tomorrow. Every player on the Kings’ active roster contributes money to the Kings Community Corner, through which tickets are distributed to families who would otherwise be unable to attend games, and six players -- Bernier, Simon Gagne, Mike Richards, Dustin Penner, Scott Parse and Brad Richardson -- all personally purchase a set of four 100-level season seats, from which tickets are dispersed for each individual game, within the organization of the player’s choice. While Richards’ tickets go to Padres Contra el Cancer (Fathers Against Cancer), “Gagne’s Gang” is the Leukemia & Lymphoma Society (LLS), “Penner’s Posse” is the Salvation Army, and both “Parse’s Party” and “Richie’s Rascals” come from the After School All Stars.Although all the ticket recipients are fortunate to be treated by the athletes themselves, “Bernier’s Angels,” all CHLA(Chrildren's Hospital, LA) affiliates, receive something extra special. So the scorer of the most famous goal in Canadian hockey history, Paul Henderson, has CLL and Simon Gagne donates his seats to Leukemia & Lymphoma Society. Ice Hockey and leukemia and charity in the same story. I am starting to feel this is some special connection. I love hockey and I am thrilled when I see stars give to help those with blood cancers. It just feels good and makes me proud of my home team. Many of you have seen this clip before. I am reposting as it is the first in a series of interviews that when strung together should make the average primary care provider much more comfortable with the diagnosis and management of his or her CLL patient.. The reality is that many patients, especially CLL patients, who nearly always have enough time to learn about their disease before needing therapy are often more up to date on the latest than their primary care provider who may not see or recognize too many CLL patients. I am trying to change that knowledge gap. This small pilot project will give you a sense of my other life in CME (continuing medical education) as a medical director. Primary Issues is the online journal for PCPs where I plan to publish these video snippets with the text and the questions to measure outcome that you see below. I need your help first . Tell me what you think works and what misses. Tell me what I should be saying to your PCP. Understand this clip is just the briefest opening to what is CLL. It is of course not the whole story. Drs Kipps, Pagel, and Wiestner will be talking more about diagnosis, symptoms, complications, treatment and the overall role of the local primary care provider in the patient's care. I promise I won't post the same clip twice again, I just needed to start at the beginning. Please email at bkoffmanmd@gmail.com or post your comment or suggestion. It will help me and may help others. 1: It is the most rare of all adult chronic leukemia. 2: It usually presents in an aggressive fashion with B symptoms and white counts over 100,000 that need prompt attention. 3: It is nearly always asymptomatic, doesn’t progress, and any treatment other than reassurance should be avoided. 4: It may be very aggressive and symptomatic or it may be very indolent and asymptomatic. Chronic Lymphocytic Leukemia or CLL is the most common adult leukemia in the United States, with approximately 15,000 new cases a year representing about 30% of all adult leukemia. The male to female ratio is 1.7: 1 and the average age at time of diagnosis is 70 years old, but it not unusual to find it in a 30 year old (Hernández JA, Land KJ, McKenna RW. Leukemias, myeloma, and other lymphoreticular neoplasms. Cancer 1995; 75:381). It is more common in Caucasians, and less common in Asia. These differences appear to be genetic as they persist when the ethnic population moves to America. Ashkenazi Jews may be at particularly higher risk (Leukemia. 1998 Oct;12(10):1612-7.Epidemiology and ethnic aspects of B cell chronic lymphocytic leukemia in Israel.Shvidel L, Shtarlid M, Klepfish A, Sigler E, Berrebi A). What makes CLL so difficult for both doctor and patient alike is that about 25% of patients present with asymptomatic disease found incidentally on a routine blood count that may never need treatment, whereas up to 10% may present with rapidly climbing lymphocyte count and enlarging nodes associated with fevers, drenching night sweats, extreme fatigue and/or unexplained weight loss that demand immediate treatment. Others follow a course somewhere in between. CLL absolutely demands personalized care. Sometimes it seems being smart and having connections allows you to see the train wreck coming, but may not let you get off the train. Still in Dallas trying to fly home from Orlando. I was notified as we landed of the delay due to change of planes. That pushed back our departure just long enough to catch the start of the weather delay. Now we have been delayed three more times for mechanical issues. 10 or 15 minutes each time. I get test messages every 10 to 15 minutes with the latest update from American Airlines. But we all know that nothing on a plane takes 10 or 15 minutes, but they soften the blow with these mini delays until sometimes it's too late to do anything, to find another way home to the west coast. I thought about taking a later flight out when I first heard of the trouble, but this flight was scheduled to leave two hours earlier so I gambled it was the better choice. The joys of flying. I guessed wrong. Sometimes CLL is like that. You might know that your FISH report is bad news, that the best option for a remission will whack your marrow, that infections are a significant risk, but what can you do? You do your best is what you do. Make a wise choice and hope for the good response without too much damage and keep moving forward. Sometimes you realize that maybe you didn't make the best choices, but you must forgive yourself and move on. How could you know, and even if you did know, it might not have made any difference. The one advice I have for flying or tackling CLL is to keep your options open. Try to avoid the last plane home that night. Look at the departure schedule. Know your Plan B. Have your airline phone number on speed dial. And bring a few extra days of your meds just in case. Try not to close doors for future cancer treatments and try to walk through doors that open that might lead to a chance for a long healthy spell between decisions and delays. They may not stay open for long, so the timing of when to start therapy is always tricky. As I have said before, the best time to start therapy is a few weeks before you need to. I will eventually get home. The mechanic is aboard. Maybe we can leave real soon? We were just ask to fasten seat belts so that's a very good sign. I am off to Ohio State next week for my clinical trial assessment. No direct flights I am afraid between anywhere in southern California and Columbus. I chose to fly through Phoenix to avoid weather. I am optimistic that route was a wise choice. But my real optimism is reserved for my banging the door open to Dr. Byrd's trial with PCI-32765 and ofatumumab, That I am betting will turn out to be a sea change of a wise choice. I am finishing this post 30,000 feet up in the air nearing home, so all is well. All my recent upbeat posts on CLL begs the issue that we will all die. We don't get to choose when or of what we die, but he can chose how we deal with the process. So a quick break from the nitty gritty of CLL to take a look at the nitty gritty of life and death, whether you do or don't have an "incurable" cancer and whether or not you are a doctor. The following is a provocative article from Zocalo Public Square, an organization that explores a wide range of current and challenging topics in various forums. Good stuff and worth getting to know. Dr. Murray, the author of this article is a thoughtful assistant clinical professor at USC (where I taught for years as a clinical professor) and has written other articles that you can find at Zocalo Public Square. Like my hero, Chaya Venkat at http://updates.clltopics.org/ I have avoided selling anything through my website or promoting anything more than a bone marrow drive or a worthy charity. I am now going break that rule to make a heartfelt sales pitch for a project that I was involved with in an effort to help fellow CLLers or those with other cancers. For the last several months I have been working with my friend, Dr. Larry Deutsch an international renowned hypotherapist. Like me, Dr Larry is a Canadian family doctor. Like me he teaches other doctors. Like me, Dr. Larry has needed to change the nature and scope of his practice because like me Dr. Larry Deutsch has CLL. We have been collaborating on an audio file that uses his expertise and empathy and my knowledge of the disease from the inside out to help patients cope and maintain a calm sense of control with the diagnosis of leukemia and lymphoma in particular and cancer in general. I believe that the MP3 that we produced is strong medicine. Larry is a powerful hypnotherapist with an important message. Let me be clear. We are not promising a melting away of your cancer by a sheer act of will. We are not promising any cures. We are simply trying to build your confidence in dealing with a process that can often feel overwhelming. Dr Deutsch did the heavy lifting on this project, but I am very proud of the part I played and very happy with the final result. Please listen to a sample on this webpage. Every sale will generate a donation to CLLPAG in Canada and LRF in the USA, two important organizations that help the CLL and lymphoma community. I have worked with them both. Their conferences are first rate and important to many patients and caregivers, but they could do so much more with more support. We all do so much better when we can get some help that allows us to slow down, and let go of the stress. As I have been known to say, we are all in this together. Hope my readers are OK with this bit of a commercial, but I am a believer in getting behind what you believe in and I do believe that how we cope with our cancer plays a role in how we do with our cancer. I will publish more links to ASH videos over the next few days, and some stuff on 11q deletion, but tomorrow I leave for a conference on CME in Orlando for a few days. What is CLL? Dr. Adrian Wiestner from the NIH gives an answer. This is pretty basic stuff for us experienced CLLers, but I think the clarity of the dual nature of CLL is particularly well presented. It is a very short segment of a much longer interview at ASH 2011 with Dr. Adrian Wiestner who hails from the NIH and who has done and is doing very important research in CLL. And is he is a great guy too. Most primary care providers are clueless about CLL so I am putting together a program of videos and education programs to teach them how to better care for these patients. More to come. My friend and fellow CLLer, the Seattle based journalist Andrew Schorr does a great service to CLL patients in particular and many others with chronic illnesses in general with his helpful interviews with the major researchers, often at the big medical society meeting. Here he takes a break from the "usual suspects" and interviewed me at ASH. (The American Society of Hematology) , 2011. Check out his wide ranging website full of real dialogue with doctors and patients at http://www.patientpower.info/ to learn more. I am sure you will. Unique Specimens I will be there, will you? 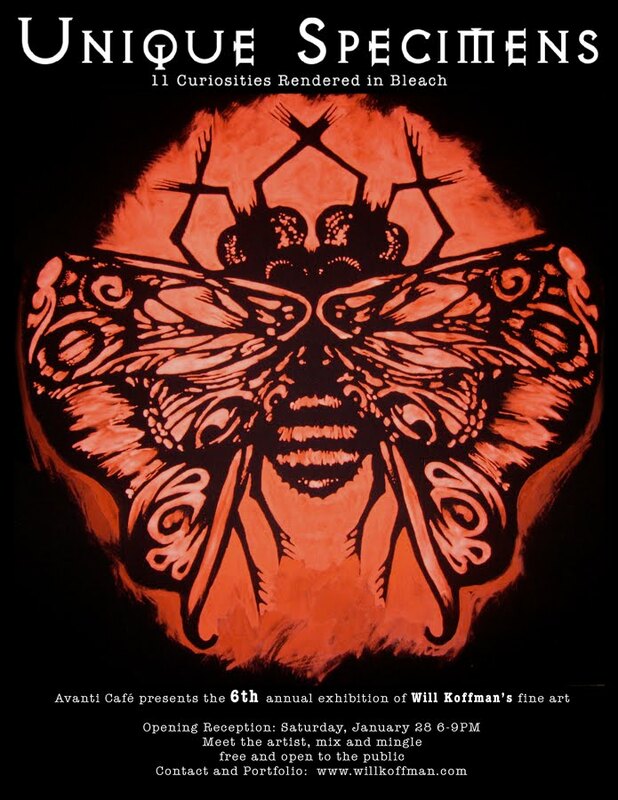 Join my son Will for his annual Avanti show opening. Patty and I will be there and I hope you join us for a splendid time. I leave the next morning for OSU, so don't miss this chance to say hello and good luck, enjoy amazing art, eat great veggie food and reunite with fun friends of all ages. An open invitation to fans, artists, enthusiasts, critics, intellectuals, press people, and every living member of the secret subculture of Orange County. Back to where it all started. 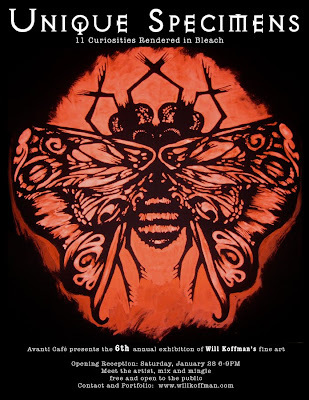 The opening for my 6th Annual show at Avanti Cafe will be held on the evening of Saturday January 28, a free event as always. Vegetarian food, craft beer, and real art - it only happens once a year! This very nice blog post deals with the business as much as the scientific aspects of the enthusiasm about Bruton's Tyrosine Kinase (BTK) Inhibitors, specifically PCI-32765 in CLL and other B cell lymphomas. It is a nice simple introduction to how the BTK inhibitors work and outlines the little but promising data presented at ASH 2011. The blog does not mention the 89% progression free survival in CLL. I suspect we still don't have the whole story. In fact, I am sure we don't. Am I and many others over excited about this little pill when the evidence is still pretty sparse? Probably, but there doesn't seems to be much downside, and the other options of doing nothing or using an established therapy sure have their own very real problems. And I can always move onto those options later if PCI-32765 doesn't work out. Moving in the other direction is not a likely option. I am not going there. I have every reason to believe that I will be part of the vast group of dramatic responders, especially since my disease is so concentrated in my nodes and my 11q deletion has pretty much done everything by the book so far, which means my clone should melt away in this trial. I see Dr. Kipps in three days to go over my bone marrow biopsy and get his final blessing on my plans. I have been posting important and what I hope have been meaningful articles and requests. Legislation is being proposed that may block our access to publicly funded research and the blog post below outlines the story. Please carefully scrutinize this pasted directly from http://e-patients.net/archives/2012/01/open-knowledge-saves-lives-oppose-h-r-3699.html and see if you don't agree. If you do, then please let your voices be heard and share the link to http://e-patients.net with others. My take is that it seems a particularly self servicing slight of hand to call the requirement for public access to publicly funded research "preventing regulatory interference". As as doctor on staff at a hospital, I have access to most articles through the library, but most are not so lucky. BLOG > GENERAL > OPEN KNOWLEDGE SAVES LIVES. OPPOSE H.R. 3699! Open knowledge saves lives. Oppose H.R. 3699! Note: Although currently not a member of the SPM, I have been involved, since its inception, with Tom Ferguson and others, in the creation of the e-patients white paper . I am also one of the co-founders of the SPM and one of the volunteers who created the infrastructure and policies of JOPM, an Open Access, peer-reviewed publication where articles are published at no cost . Today, I use the privilege offered to the founders of this group to post on e-patients.net in my name only and not representing SPM in any way. In 2008, in culmination of years of effort and community interaction, the National Institutes of Health made all federally-funded research publications openly accessible by publishing the NIH Public Access Policy. The purpose of mandating such open access, at a maximum 12 months after publication, was to ensure that the findings are accessible to all their potential users, not just (as in the print era) to those whose institutions can afford subscription access to the journal in which they happened to be published. Opening access maximizes dissemination, a key element to maximize scientific discovery (see the great 2008 presentation by Elias A. Zerhouni, M.D., NIH Director, to the Subcommittee on Courts, the Internet, and Intellectual Property). Of course, ACOR members were highly supportive of the proposed policy and provided a significant number of comments during the initial RFI period. SEC. 217. The Director of the National Institutes of Health (“NIH”) shall require in the current fiscal year and thereafter that all investigators funded by the NIH submit or have submitted for them to the National Library of Medicine’s PubMed Central an electronic version of their final, peer-reviewed manuscripts upon acceptance for publication, to be made publicly available no later than 12 months after the official date of publication: Provided, That the NIH shall implement the public access policy in a manner consistent with copyright law. Compliance with this Policy remains a statutory requirement and a term and condition of the grant award and cooperative agreement, in accordance with the NIH Grants Policy Statement. Right now, the great gift to the public that is the NIH Public Access Policy, is under serious attack with a proposed piece of legislation. H.R. 3699, aka The Research Works Act (RWA), that would prohibit the deposit of the manuscripts mentioned above, seriously impeding the ability of patients and caregivers, researchers, physicians and healthcare professionals to access and use this critical health-related information in a timely manner. Oppose H.R. 3699! As any person looking for information of significance about cancer knows, having access only to the abstract, and not to the full text article, is insufficient. Ironically & symptomatically, the 2004article by Elias A. Zerhouni, then-director of the NIH, entitled “NIH Public Access Policy” explaining the rationale behind the proposed policy is behind a paywall and demonstrates the extent of the problem! What is H.R. 3699 / RWA? LIMITATION ON FEDERAL AGENCY ACTION. No Federal agency may adopt, implement, maintain, continue, or otherwise engage in any policy, program, or other activity that (1) causes, permits, or authorizes network dissemination of any private-sector research work without the prior consent of the publisher of such work; or (2) requires that any actual or prospective author, or the employer of such an actual or prospective author, assent to network dissemination of a private-sector research work. If public tax money is used to fund research, that research becomes “private research” once a publisher “adds value” to it by managing the peer review. Since that public research has thereby been transformed into “private research,” and the publisher’s property, the government that funded it with public tax money should not be allowed to require the funded author to make it accessible for free online for those users who cannot afford subscription access. Because of the highly successful public access policy, millions of Americans now have access to vital health care information from the NIH’s PubMed Central database. Under the current policy, more than 90,000 new full-text biomedical manuscripts are deposited for public accessibility each year. For all of us who are “scholarly poor” a term coined and defined by Peter Murray-Rust as “denied access to information freely given by scientists in their publications”, the policy may have been the most important piece of legislation favoring the emergence and sustainability of Participatory Medicine. This takes increased significance now that the only inflation in health care spending is the 19% yearly increase in individual spending, forcing people to pay much closer attention to what is being done to them by any professional actor of the medical system. As I wrote 2 1/2 years ago “Will The Great Recession Create Millions of e-Patients?” What I had not imagined was the devastating impact of local budget squeezes on public libraries hours of operations, which have been severely hit across the nation. Since publishers use the access to public libraries as an excuse to close universal internet access, their argument looks pretty weak for the foreseeable future. a movement in which networked patients shift from being mere passengers to responsible drivers of their health, and in which providers encourage and value them as full partners. How can you be a responsible driver of your health if you don’t have direct access to all information? That’s why Dave has been fighting for his damn data and similarly why ACOR has been engaged in multiple efforts to maximize the dissemination of any and all scientific publication that relates to an ACOR group condition. Seeing a corrupt travesty of the democratic process used today to promote the interests of a few gatekeepers at the expense of millions of people is very disturbing. The NIH and other agencies must be allowed to ensure timely, public access to the results of research funded with taxpayer dollars. Please oppose H.R. 3699. You’ll be in great company! I oppose H.R. 3699 (“To ensure the continued publication and integrity of peer-reviewed research works by the private sector.”) because it is a classic example of “regulatory capture” by an industry that is feeding off of government largesse. It is a frontal attack on the open access movement, which scientists are increasingly seeing as critical to the further progress of science. […]I strongly suggest that the authors of this bill consult the Panton Principles, put forward by a group of scientists at Oxford University, or read Michael Nielsen’s new book, Reinventing Discovery, about the importance of open access to the future of science. Please don’t write laws that protect 19th century industries against 21st-century disruption! WTF? How did academia become so risk-adverse? The whole point of tenure was to protect radical thinking. But where is the radicalism in academia? Please, I beg you, regardless of whether or not we can save a dying industry, let’s collectively figure out how to save the value that prompted its creation: making scholarly knowledge widely accessible. Journal articles are widely available in major academic centers, public libraries, universities, interlibrary loan programs and online databases. Many academic, professional and business organizations provide staffs and members with access to such content. To add insult to injury look at the two co-sponsors of the bill. Darell Issa is the wealthiest member of congress, with an estimated fortune of between $165 Million and $451 Million in 2010. I doubt that paying $32 to $40 for a scientific article makes a dent in his monthly spending, unlike the situation for most Americans. What is completely incomprehensible is that Darell Issa is avowedly supporting Openness. His Twitter page says it all: “I also greatly enjoy an #OPEN, accessible & uncensored internet.” The Atlantic wondered “Why Is Open-Internet Champion Darrell Issa Supporting an Attack on Open Science?” which ends with “And that’s just it. If the goal is protecting the publishing industry, this bill’s a winner. But for those interested in improving access to scientific research, they should stay far, far away.” Do you start to see a trend in the objections to this nasty piece of legislation? The 2nd co-sponsor, Democrat Carolyn Maloney, is the largest recipient of contributions from the publishing industry. Michael Eisen discovered via MapLight, a site tracking political contributions, that Dutch publisher Reed Elsevier and its senior executives made 31 contributions to members of the House in 2011, of which 12 went to Representative Maloney. This includes contributions from 11 senior executives or partners, only one of whom is a resident of her district. Why should e-patients oppose H.R. 3699? This widget has been placed on a website (e-patients.net) that is not authorized. Unfortunately the representative is not interested and does not allow emails to be received from outside of her district (although her proposed legislation would effect the whole nation), so unless she is your congressperson, you are stuck sending a letter or a fax or a tweet.